Portman Estate Area Guide - What makes Portman Estate so great? Where do Portman Estate locals go? The best wings, ribs, burgers and pulled pork in town! It rivals even the most well known and popular barbecue restaurants. A really cosy pub with traditional interiors, this place is a great little spot. Brekkie, lunch, fresh salads, fine sandwiches, uplifting juices and more... Perfect for any mood. Celeb hangout with grand surroundings - skip dinner and just book a hotel room! A quiet spot moments from the fantastic cafes and restaurants in the heart of Marylebone. Don't forget your table tennis bats! Part of the prestigious chain of cafes and restaurants, you might even spot a celebrity or two in this chic cafe restaurant. A fourth generation family delicatessen serving homemade sandwiches and lunchtime treats. An Aladdin's cave of foodie delights - fresh produce, charcuterie and a cheese room. If they let me into heaven, I hope it looks like this! French food and pretty décor, Aubaine is a small London-based chain. Arguably the best freshly roasted coffee in Marylebone, with a vast selection of internationally inspired light meals and snacks. Super trendy spot! Every Sunday 10am - 2pm, the market attracts many people far and wide. It's a no brainer for any London foodie! Share your favourite place to go to in Portman Estate. "The wold's first attempt at an indoor ice rink was tried at the Baker Street Bazaar near Portman Square in 1844. It lacked a certain popularity, as the ice being mad from hog's lard and chemical salts, had a distinct whiff of cheese wafting from it!" 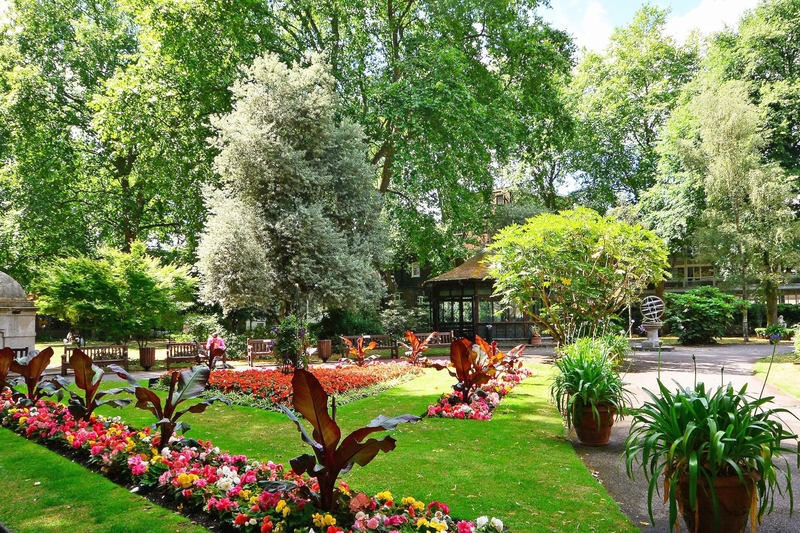 It is the tranquil spots in London like Paddington Street Gardens that really make me stop and appreciate the city. With so many upmarket designers and eateries along Marylebone High Street, you're spoilt for choice! The handsome architecture around Regent's Park enhances the prestige of the area. The Portman Estate is a property estate in Marylebone, Central London. It lies between Oxford Street and Edgware Road, and includes Portman Square, Manchester Square, and some parts of Baker Street and Gloucester Place. The estate was constructed between 1764 and 1810, firstly by Henry William Portman, then by his son Edward Berkeley Portman, whose son Edward would become the first of the Viscounts Portman. The Estate did not carry out the building work itself - it dictated street plans, and then leased the land to speculators and private builders to carry out the actual construction, and the architects such as James Thompson Parkinson were instructed by the Estate. What are your favourite things about Portman Estate? Find out how much your flat or house is worth om Portman Estate. Feedback about living in Portman Estate has been submitted directly by the public and may not neccessarily reflect the views of Foxtons. The description of Portman Estate was modified from Wikipedia and is available under the Creative Commons licence. Land Registry data is Crown copyright. All the views and contributions contained within Foxtons Local Life are those of the contributors. All content is assessed before publishing for taste, however free opinion is encouraged. Foxtons accept no payment or sponsorship for content that is posted about Portman Estate.